Cal Poly Baseball started off Big West Conference play with a 3-0 sweep over CSUN. The games took place from March 29-31 inside Baggett Stadium. With the win, Cal Poly (12-13, 3-0) sits in sole possession of first place in the Big West Conference. CSUN (12-16, 0-3 Big West) are currently in last place. The series opened with a classic pitching duel. Senior pitcher Jarred Zill had a dominant start, only allowing one earned run 5 1/3 innings while only allowing four hits and striking out six. After that, senior pitcher Michael Clark shut the door with a masterful 3 2/3 innings save. Over that span, Clark did not allow any runners to reach base, striking out six Matador batters. On the offensive side, CSUN struck first, taking a 1-0 lead in the third inning off a single. 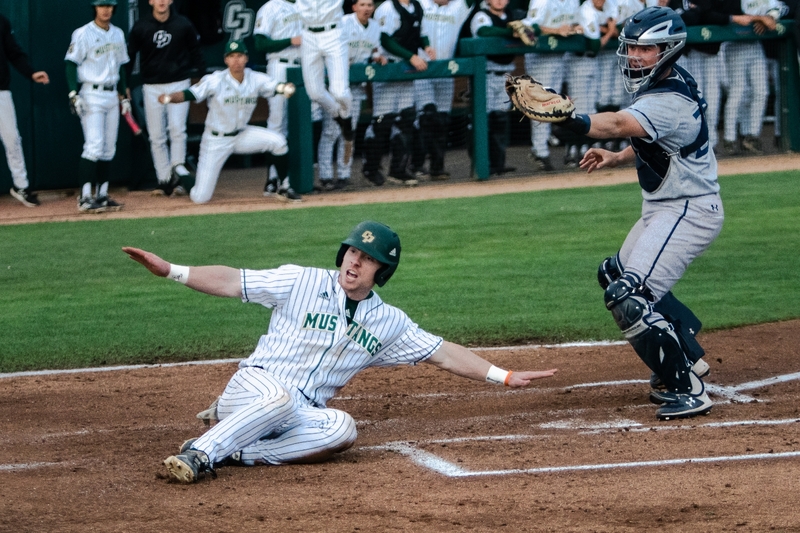 Cal Poly quickly countered when junior center fielder Bradlee Beesley sent the ball up the middle to drive in senior shortstop Dylan Doherty for the Mustangs’ first run. Cal Poly tacked on a second run off of a single from junior catcher Myles Emmerson that drove in junior second baseman Nick DiCarlo. Cal Poly then got aggressive, attempting sending freshman designated hitter Noah Taylor home, where he was tagged out. However the two runs were enough to get the job done and Cal Poly took the first game winning 2-1. In the second game, Cal Poly utilized the same formula of dominant pitching and timely hitting for a 3-1 win. Once again, CSUN led early through a double in the first inning, driving in a run. However, that was the only offensive success CSUN had. In the third inning, Beesley doubled, driving home Emmerson to tie things up at 1-1. In the fourth inning, Cal Poly took the lead after Taylor hit a sacrifice fly for a 2-1 lead. Once again, the Cal Poly pitchers were the driving force behind the team’s success. Senior pitcher Bobby Ay got things started with 4 solid innings after allowing the one CSUN run in the first inning. After that, sophomore pitcher Taylor Dollard picked up where Ay left off with 3 no-hit relief innings, with 5 strikeouts along the way. Sophomore pitcher Dylan Villalobos put in his own shut out inning and Clark once again secured the game for the Mustangs with a shutout ninth inning, striking out two of the three batters he faced. Clark picked up his second save of the series as Cal Poly won 3-1. Pitching again lead Cal Poly to success, starting with sophomore pitcher Darren Nelson who had 6 solid innings, only allowing four hits and one run. Villalobos came in to snuff a potential CSUN rally, but was unsuccessful after CSUN roped a triple down the right field line and narrowed Cal Poly’s lead to 3-2. Then, the Cal Poly bullpen swung into action. Sophomore pitcher Andrew Alvarez halted the CSUN rally with 1 1/3 innings of shut out ball. Then Clark came in, slamming the door shut with another no-hit save for the third time this series. Cal Poly won with a final score of 4-2. Cal Poly hosts Santa Clara Tuesday, April 2 at 6 p.m. The Mustangs will also host defending Big West Champions Cal State Fullerton for a three-game series starting Friday, April 5 at 6 p.m. inside Baggett Stadium.